The subtropical fruit, lucuma, comes from the dry subtropical Andean coastal valleys in Peru. Then, it is introduced into Ecuador and Chile. It grows at elevations with 1000-2400 meters height. Lucuma trees most grow in Cajamarca, Ancash, Lima, and Ayacucho are the major areas of Peru. On ceramics at burial sites of the indigenous people of coastal Peru, people found Lucuma. The Moche people love agriculture so deeply that they often chose fruits and vegetables as representations, including lucuma, in their art. This fruit is very healthy and there are great deal of carotene, vitamin B3, carbohydrates, fiber, vitamins and minerals (such as iron etc.) in it. In some counties, one of the the most popular ice-cream flavors is also Lucama. Lucama flavor is popular in its native range. In Peru, it even exceeds the demand for flavors of strawberry, chocolate, and vanilla, which is popular globally. 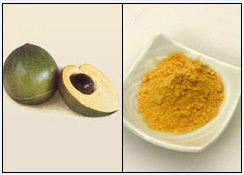 The raw powder is made from Lucuma fruit, which makes a great natural sweetener. One spoon of lucuma powder can be added into desserts, ice creams, and smoothies etc.